Fernando carried the team to a last race championship definition delivering outstanding results in a car that wasn’t capable to compete with the top main rivals. Kudos for Fernando and also to Massa who showed some form at the end of the seson. Keep it up. Alonso or Vettel? who has the advantage? So 2 races remaining and the big question is already out there. Who have the inside line for the remaining two races on the American soil? I will not write 1,000 lines analyzing the circuit’s characteristics and the cars capabilities, because at the end I think we all know who have the inside line, don’t we? Since the Singapore GP Red Bull has shown that is the team to beat in any type of circuits, Adrian Newey has done it once again and unfortunately in this case as in many others the drivers are not the heroes. However this does not mean that Red Bull team and driver will have an easy ride to their 3rd consecutive championship in these next two races left. Fernando Alonso has backed up his words delivering great results that have kept him in the fight for the title hunt. After the Abu Dhabi gran prix Ferrari’s chairman Luca Montezemolo have urged team principal Stefano Domenicalli to push even harder in order to give Alonso a car capable of winning races. Although Ferrari may do a final attempt to deliver an improved car, we have seen in the past races how results have not matched even Ferrari’s engineer expectations; therefore we may see that happening again. In terms of teammates help, I think Fernando may have the advantage on this one. Even though you are supposed to have only one teammate Alonso could well count with the help of former teammate/rival Lewis Hamilton, his own teammate Felipe Massa and even Mark Webber. In Webber’s case I don’t see him directly helping Alonso by letting him through but by impeding Vettel to score as many points as possible. No matter who wins the championship, this season will go as one of the most competitive in the recent years, and as a fan that is what matters. Fernando and Vettel have now to concentrate even more on their goals and ask the almighty to ship away some much needed good luck, which has proven to be very decisive when it comes to winning races this year. Although Button and Vettel did a great race, the best news from this event was that Fernando Alonso scaped without serious injuries due to a crash in the first corner. First Grosjean collided with Lewis Hamilton who then collected Alonso and Sergio Perez. Hear the sound of the impact in second 11. 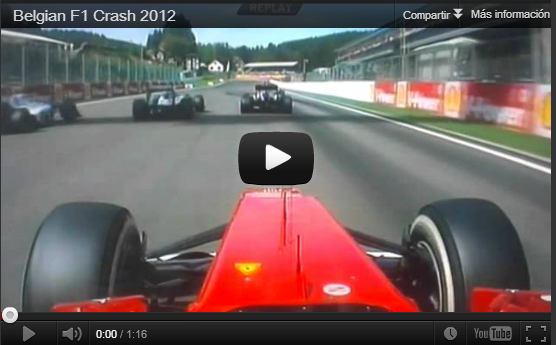 Alonso was very lucky to escape without a serious injury from this collition. Today Fernando Alonso took another pole position in consecutive weekends with similar damper conditions. It is a great result, and better yet is the fact that Ferrari have considerably improved their form compared to how they started the championship. Now Ferrari is the team to beat, they have the current best driver in the grid and also the best car. Although all of this is good for the team there is a negative note, Felipe Massa’s performance hasn’t been there since maybe the 2010 German GP, where Ferrari scored their last 1, 2 since Fernando’s arrival. I have less doubt now that someone else is taking Massa’s seat for the next season and I don’t want to sound biased with Fernando being a better driver than Massa but at this point even Brazilians may agree. I have said several time now that when Felipe leave the team he will say (true or not) that Fernando had a better car than his, this will be the only way he may justify this big performance gap that the Spaniard have established.